The following is an excerpt from an article by the title of this blog post, that appears in ‘Z magazine’s September 1 issue–describing how central bank policies have become a major contributor to income inequality, subsidizing and boosting capital incomes, as well as now are a primary cause of recurrent financial crises. “This September 2017 marks the nineth year since the last major financial crisis erupted in 2008. In that crisis investment banks Bear Stearns and Lehman Brothers collapsed. So did the Fannie Mae and Freddie Mac, the quasi-government mortgage agencies, that were then bailed out at the last minute by a $300 billion US Treasury money injection. Washington Mutual and Indymac banks, the brokerage Merrill Lynch, and scores of other banks and shadow banks went under, or were forced-merged by the government, or were consolidated or restructured. The finance arms of General Motors and General Electric were also bailed out, as were the auto companies themselves, to the tune of more than a hundred billion dollars. Then there was the insurance giant, AIG, that speculated in derivatives and ultimately required more than $200 billion in bailout funds. The ‘too big too fail’ mega banks—Citigroup and Bank of America—were technically bankrupt in 2008 but were bailed at a cost of more than $300 billion. And all that was only the US. Banks in Europe and elsewhere also imploded or recorded huge losses. The US central bank, the Federal Reserve, helped bail them out as well by providing more than a trillion US dollars in loans and swaps to Europe’s banking system as well. Although the crisis at the time was deeply influenced by the crash of residential housing in the US. Few US homeowners were bailed out, unlike the big banks, insurance companies, auto companies, and other businesses. More than 14 million US homeowners were allowed to foreclose on their homes. A mere $25 billion was provided to rescue homeowners, and most of that going to bank mortgage servicing companies who were supposed to refinance their mortgages but didn’t. More than $10 trillion conservatively was provided to financial institutions, banks and shadow banks, and big corporations, and foreign banks by US policy makers in the government and at the US central bank, the Federal Reserve. $25 billion for 14 million vs. more than $10 trillion for capitalists and investors. A common misunderstanding is that the banking system bailouts were managed by the US Congress passing what was called the Trouble Asset Relief Program, TARP. Introduced in October 2008, TARP provided the US Treasury a $750 billion blank check with which to bail out the banks. But less than half of TARP was used, and most of that went to the auto companies and smaller banks. Only half of the $750 billion was actually spent. By early 2009 the remainder returned to the US Treasury. So Congress didn’t actually bail out the big banks—the AIG, Bank of America, Citibank, investors in the subprime mortgage bonds that collapsed, etc. The real bail out was engineered by the US central bank, the Federal Reserve, in coordination with the main European central banks—the Bank of England, European Central Bank, the Bank of Japan. The Central banks bailed out the big banks. That has always been the primary function of central banks. That’s why they were created in the first place. It’s called the ‘lender of last resort’ function. Whenever there’s a general banking crisis, which occurs periodically in all capitalist economies, the central bank simply prints the money (electronically today) and injects it free of charge into the failing private banks, to fill up and restore the private banks massive losses that occur in the case of banking crashes. Having a central bank, with operations little understood by the general public, is a convenient way for capitalism to rescue its banks without having to have capitalist politicians—i.e. in Congress and the Executive—do so directly and more publicly. Central banks take the heat off of the politicians, who otherwise would have to raise taxes to bail out the banks—and thus incur the ire of the general public even more so than they do for not preventing the crisis. But central banks since 2008 have been evolving toward a new primary function. No longer just bailing out the banks when they get in trouble. But providing a permanent regime of subsidization of the banks even when they’re not in trouble. The latter function is new, and has become a permanent feature of the capitalist global banking feature in the post-2008 period. For the US banks were fully bailed out by 2010. But the US central bank, the Federal Reserve, as well as other major central banks, have simply kept the flow of free money, often just printed money, into the banking system even after the banks were effectively bailed out. In other words, since 2010 the Federal Reserve has continued to provide free money to the banks and continued to buy up the collapsed subprime mortgage bonds from banks and individual investors. In short, it has been subsidizing the profits of the financial system for the past nine years. With the Fed in the lead, in 2008-09 the central banks of the advanced capitalist economies simply created money—i.e. the dollars, the pounds, euros and yen—and allowed banks and investors to borrow it virtually free. That is, the Fed and other central banks simply opened electronic accounts for the banks within the central bank. Banks were then allowed to borrow that money that was ‘electronically printed’, at essentially no interest. It was free money. But free money in the form of near zero interest was still not the full picture. The Fed and other central banks were also pro-active in providing money to the banks. The Fed and other central banks went directly to the banks, as well as other institutional and even private investors, and said: ‘we’ll also buy up your bad assets that virtually collapsed in price as a result of the 2008-09 crash. This direct buying of bad mortgage and government bonds—and in Europe and Japan, buying of corporate bonds and even company stocks—was called ‘quantitative easing’, or QE for short. And what did the central banks pay for the assets they bought from banks and investors, many of which were worth as low as 15 cents on the dollar? No one knows, because the Fed to this day has kept it secret how much they overpaid for the bad assets they bought from individual investors, bankers or corporations. But the QE and the effectively zero interest rates continued for nine years in the US and the UK. And in 2015 it was accelerated even faster in Europe. And since 2014 faster still in Japan. And even in China after 2015, when its stock market bubble burst. Central banks of the major economies after 2008 have thus opened a ‘fire hose’ of free money to their private banks and their investors. And in the course of the past nine years, the private capitalist banking system has become addicted to the free money. They cannot ‘earn’ profits on their own any longer, it appears. They are increasingly dependent on the free money from their central bankers. This is a fundamental change in the global capitalist economic system in the past decade—a change which is having historic implications for growing income inequality worldwide in the advanced economies as well as for another inevitable global financial crisis that will almost certainly erupt within the next decade. In the last financial crisis of 2008-09, central banks rescued their private banks by ensuring zero interest rates at which they could borrow funds. But central banks went a step further. The Fed and others pro-actively went directly to banks and investors and bought up their collapsed subprime bonds and other securities as well. But we do know the total amount of ‘bad assets’ they bought? The total was more than $20 trillion—i.e. in free money provided at zero rates and by central banks buying the ‘bad assets’ from the banks and investors by paying them more than the collapsed market prices at the time for those mortgage bonds and securities. In the US, the Fed officially purchased $4.5 trillion in ‘bad assets’ between 2009 and 2014. But it was actually more, perhaps as much as $7 trillion. That’s because as some of the Fed purchased bonds matured and were paid off, the Fed reinvested the money once again to maintain the $4.5 trillion. So US banks and shadow banks got free money loans at 0.1% interest rates for nine years, plus the Fed directly bought up additional securities from investors in the amount of around $7 trillion. The cumulative totals from the zero rates and QE bond buying are likely more than $10 trillion for the US alone. That’s how the US banks got ‘bailed out’, not by the US Congress and the TARP program. But the same occurred by other central banks of the advanced economies. The 2008-09 crash was global, so the Fed was not the only central bank player is this massive money printing and bailout scam. The European Central bank, as of 2017, has bailed out Europe banks via its QE and other programs to the tune of $4.9 trillion so far. The Bank of England, another $.7 trillion. And the Bank of Japan as of mid-2017 by more than $5 trillion. The People’s Bank of China, PBOC, did not institute formal QE programs. But after 2011 it too started injecting trillions of dollar in equivalent yuan, its currency, to prevent its private sector from defaulting on bank loans, to bail out its local governments that over invested in real estate, and to stop the collapse of its stock markets in 2015-16. PBOC bailouts to date amount to around $6 trillion. And the totals today continue to rise for all, as the UK, Europe, Japan, and China continue their central bank engineered bail out binge, and in the case of Europe and Japan are actually accelerating their QE programs. Conservatively, therefore, the total bail outs from QE and QE-like programs among the big central banks globally—US, UK, Europe, Japan, and China—amount easily to more than $25 trillion. That’s $25 trillion of money created out of thin air. Contrary to many critiques of rising debt levels since 2009, it is not the level of debt itself that is the problem and the harbinger of the next financial crash. It is the inability to pay for the debt, the principal and interest on it, when the next recession occurs. So long as economies are growing, businesses and households and even government can ‘finance’ the debt, i.e. continue to pay the principal and interest some way. But when recessions occur, which they always do under capitalism, that ability to keep paying the debt collapses. Business revenues and profits fall, employment rises and wages decline, and government taxes collections slow. So the income with which to pay the principal and interest collapses. Unable to make payments on principal and or interest, defaults on past incurred debt occur. Prices for financial assets—stocks, bonds, etc.—then collapse even faster and further. Businesses and banks go bankrupt, and the crisis deepens, accelerating on itself in a vicious downward spiral. That’s a great recession—or worse, a bona fide economic depression. Think of it another way: the $25 trillion plus is what the central banks transferred in bad debt from the balance sheets of the banks and private corporations to their own central bank balance sheets. In other words, the private corporate debt at the heart of the last crisis has not been removed from the globally economy. It has only been shifted, from the business sector to the central banks. And this central bank debt has nothing to do with national governments’ debt. That’s a totally additional amount of government debt, as is consumer household debt which, in the US, is more than $1 trillion each for student loans, auto loans, credit cards, and multi-trillions for mortgage loans. Ominously, moreover, in recent months defaults on student, auto and credit card debt have begun to rise again, already in the highest in the last four years in the US. Finally, it’s not quite correct, moreover, to even say that the $25 trillion injection of money into the banking system since 2008 has successfully bailed out the banks globally. Despite the total, there are still more than $10 trillion in what are called ‘non-performing bank loans’ worldwide. Most is concentrated in Europe and Asia—both of which are likely the locus of the next global financial crisis. And that crisis is coming. In the interim, the central banks’ free money and bank subsidization machine is generating a fundamental dual problem within the global economy. It is feeding big time the trend toward income inequality and it is helping fuel financial asset bubbles worldwide that will eventually converge and then burst, precipitating the next global financial crash. In the US, the US central bank’s $4.5 trillion balance sheet—and the nine years of free money at 0.1% rates—have been at the heart of a massive income shift to US investors, businesses, and the wealthiest 1% households. Where did all this $4.5 trillion (really $7 trillion), plus the virtually free borrowed money at 0.1%, go? The lie fed to the public by politicians, businesses, and the media was this massive free money injection was necessary to get the economy going again. The trillions would jump-start real investment that would create jobs, incomes, consumption and consequently economic growth or GDP. But that’s not where it went, and the US economy experienced the weakest nine year post-recession recovery on record. Little of the money injection financed real investment—i.e. in equipment, buildings, structures, machinery, inventories, etc. Instead, investors got QE bail outs and banks borrowed the free money from the Fed and then loaned it out at higher interest rates to US multinational companies who invested it abroad in emerging markets; or they loaned it to shadow bankers and foreign bankers who speculated in financial asset markets like stocks, junk bonds, derivatives, foreign exchange, etc. ; or the banks borrowed and invested it themselves in financial securities markets; or they just hoarded the cash on their own bank balance sheets; or the banks borrowed the money at 0.1% from the central bank and then left it at the central bank, which paid them 0.25%, for a 0.15% profit for doing nothing. This massive money injection, in other words, was then put to work in financial markets and multiplied several fold. Behind the 9 year bubbles in stock and bond markets (and derivatives and exchange as well) is the massive $7 to $10 trillion Federal Reserve bank money injections. And how high have the stock-bond bubbles grown? The Dow Jones US stock market has risen from a low in 2009 of 6500 to almost 22,000 today. The US Nasdaq tech-heavy market has surpassed the 2001 peak before the tech bust. The S&P 500 has also more than tripled. Business profits have also tripled. Bond market prices have similarly accelerated. The 9 year near zero rates from the Fed have enabled corporations to issue corporate bonds by more than $5 trillion in just the last five years. So how do these financial asset market bubbles translate into historic levels of income inequality, one might ask? The wealthiest 1%–i.e. the investor class—cash in their stocks and bonds when the bubbles escalate. The corporations that have raised $5 trillion in new bonds and seen their profits triple in value then take that massive $6 to $9 trillion cash hoard to buyback their stocks and to issue record level of dividends to their shareholders—i.e. the 1%. Nearly $6 trillion of the profits-bond raised cash was redistributed in the US alone since 2010 to shareholders in the form of stock buybacks and dividends payouts. The 1% get $6 trillion or more and the corporations and banks sit on the rest in the form of retained cash. Congress and Presidents play a role in the process as well. Shareholders get to keep more of the $6 trillion plus distributed to them as a result of passage of legislation that sharply cuts capital gains and dividend taxable income. Corporations gain by getting to keep more profits after-tax, to distribute via buybacks and dividends, as a result of corporate taxation cuts as well. The Congress and President sit near the end of the distribution chain, enabling through tax cuts the 1% and shareholders to keep more of their distributed income. But it is the central bank, the Fed, which sits at the beginning of the process. It provides the initial free money that, when borrowed and reinvested in stock markets, becomes the major driver of the stock price bubble. The Fed’s free money also drives down interest rates to near zero, allowing corporations to raise $5 trillion more cash from issuing new corporate bonds. Without the Fed and the near zero rates, there would be nowhere near $5 trillion from new bonds, to distribute to shareholders as a consequence of buybacks and dividends. Furthermore, without the Fed and its direct $4.5 trillion QE program, investors would not have the historic excess money to invest in stocks and bonds (and derivatives and currencies) that drive up the stock and bond prices to bubble levels. The Fed, the central bank, is thus the initial enabler of the process, i.e. of the accelerating stock and bond prices that transfer so much income to the 1% when the buybacks and dividend payouts kick in. The Fed, as well as other central banks, is an originating source of the runaway income inequality that has plagued the US since late 1970s decade. It is not coincidental that income inequality began to accelerate about that time, which is also the period of which the Fed, and other central banks, themselves began to provide massive money injections to bankers and investors. Income inequality is a function of two things. One the one hand, accelerating capital incomes of the 1% as a result of buybacks and dividend payouts that generate capital gains for the 1% which constitute nearly 100% of the 1%’s total income. On the other, stagnating or declining wage incomes of non-investor households. Inequality may rise if capital gains drive capital incomes higher; or may rise if wage incomes stagnate or decline; or may rise doubly fast if capital incomes rise while wage incomes stagnate or decline. Since 2000 both forces have been in effect: capital incomes of the 1% have escalated while wage incomes for 80% of households have stagnated or declined. Mainstream economists tend to focus on the stagnation of wage incomes, which are due to multiple causes like deunionization, rise of temp-part-time-contract employment, free trade treaties’ wage depressing effects, failure to adjust minimum wages, high wage industry offshoring, cost shifting of healthcare from employers to workers, reduction in retirement benefits, shifting tax burdens, etc.. But they engage little in explaining why capital incomes have been accelerating so fast. Perhaps it is because mainstream economists simply don’t understand financial markets and investment very well; or perhaps some do, and just don’t want to ‘go there’ and criticize runaway capital incomes. The fire hose of money that central banks still continue to provide the capitalist banking system provides the basis for the growing financial asset bubbles that have been occurring worldwide once again since 2009. The zero interest rate and direct QE money continue to inject massive money and liquidity into the banking systems, at a rate far faster than investors can choose to reinvest it in real investment projects that produce real things, that hire real people, and provide real wage incomes that stimulate economic growth. As previously noted, the massive money injections are not flowing through the private banks into real investment and growth. The trillions of central bank provided money is flowing out of the advanced economies and into emerging economies; or it is flowing through the banks into the financial asset markets—i.e. stock markets, bonds, derivatives, etc.—driving up asset prices and creating bubbles in those markets; or it is being distributed in stock buybacks and dividend payouts; or it is just being hoarded in the trillions of dollars, euros, etc. on balance sheets of private corporations. As a result of Fed and other central banks’ money injections now for decades, and especially since 2008, there is a mountain of cash—virtually trillions of dollars—sitting ‘on the sidelines’. That money is looking for quick, speculative capital gains profit opportunities. That means for reinvestment short term in financial asset markets worldwide. The mountain of cash moves in and out of these global financial markets, creating and bursting bubbles as its shifts and moves. Periodically a major bubble bursts—like China’s stock market in 2015. Or a housing speculation bubble here or there. Or junk bonds or consumer debt in the US. Or the bubble in US stocks which is nearing its limit. A new global finance capital elite has arisen in recent decades, having directly benefited from and controlling this mountain of cash. There are about 200,000 of them worldwide, mostly concentrated in the US and UK, some in Europe, but with numbers rising rapidly in Asia as well. They now control more investible assets than all the traditional commercial banks combined. Their preferred institutional investment vehicles are the global ‘shadow banking system’. Their preferred investment targets are the global system of highly liquid financial asset markets. This system of new finance capitalists, their institutions, and their preferred markets is the real definition of what is meant by the ‘financialization’ of the global economy. That financialization is generating ever more instability in the global capitalist system. But it would not exist were it not for the decades of past central bank injection of free money into the global economy—an injection which has been accelerating since 2008. Will the Central Banks Retreat? In 2017 a minority of policymakers in the Fed and other central banks have begun to recognize the fundamental danger to their own system from their providing free money and QE bond and stock buying money injections. The injections have not succeeded in stimulating their real economies, they have not raised prices for goods and services which continue instead to slow and stagnate, they have not sufficiently reduce unemployment (when contingent jobs are considered), and they have not raised wage incomes while bloating capital incomes instead. They have been creating financial bubbles. So led by the Fed, the central banks of the major economies are now considering raising interest rates from the zero floor and trying to reverse their QE buying. Central bankers will meet in late August 2017 at their annual Jackson Hole, Wyoming gathering. The main topic of discussion will be raising rates and reducing their QE bloated, $15 trillion cumulative balance sheets. But as this writer has argued, they will fail in both raising rates and selling off their balance sheets. Just as they failed in generating real economic recovery since 2009. For the banking system has become addicted and dependent therefore upon their free money injections and their firehose of central bank bond-stock buying QE programs. Should the central banks attempt to retreat, they will provoke yet another financial and economic crisis. The global capitalist system has become dependent on the permanent subsidization of the banking system by their central banks after 2008. Bail outs and lender of last resort functions by central banks have transformed into a permanent subsidization function. The global capitalist system entered a new period after 2008, changing in ways fundamentally. One of those ways is a greater dependency on the capitalist state to maintain and expand levels of profitability. One of those ways is for their central banks to continue to provide free money. But the contradiction is that continued free money provisioning is driving further income inequality as well as fueling the next financial crash. 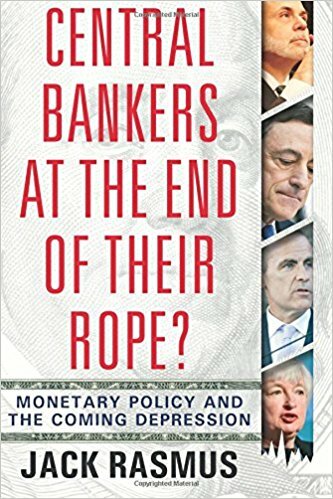 Jack Rasmus is the author of the just published book, ‘Central Bankers at the End of Their Ropes? : Monetary Policy and the Coming Depressions’, Clarity Press, July 2017. He blogs at jackrasmus.com. For more information see http://claritypress.com/RasmusIII.html. The book is now available for order on Amazon.com. This article was originally published by Jack Rasmus.